A Child Called "It" is a text that describes an eight-year period of time when David Pelzer endured emotional and physical abuse from his mother during the late 60's and early 70's. Child abuse is a sociological problem that never seems to make any headway in curbing its presence in society. 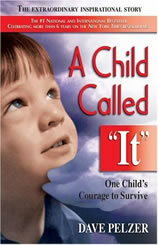 A child Called "It" by David Pelzer is an important work still today on the phenomena of child abuse in America today. Have Paper Masters custom write a research project on the book, the topic of child abuse or any aspect of Pelzer's work for you today. A Child Called “It” research paper may present a two-pronged analysis of the ever-increasing problem of child abuse. Although it is believed that there is now a greater degree of discussion of this social problem within the public discourse, a diminishment of the taboos surrounding its mention has not helped to depreciably diminish the rate at which child abuse is thought to occur within the United States. Facts To Include in a Research Paper on A Child Called "It"
It graphically recalls an eight-year period of extreme emotional and physical abuse which he withstood from his profoundly unbalanced mother. The timeframe is during the late 1960′s and early 1970s. The lack of institutional vigilance against child abuse during this period of the twentieth century is part of the discussion of this text, as well as the lasting effect of Pelzer’s ordeal. An overarching, research-based discussion of the impact of child abuse upon the victim and the larger community is presented in conclusion. Examining Child Abuse in Pelzer's book A Child Called "It"
According to Pelzer's own statement in the “Author's notes” section of A Child Called “It”, the book was deliberately written in a simple style that accurately “depicts language that was developed from a child’s viewpoint. The tone and vocabulary reflect the age and wisdom of the child at that particular time.” Indeed, to this reader’s mind, this was the most bold and effective aspect of A Child Called “It” – the complete lack of a clear and lucid explanation for Catherine Pelzer’s behavior is an accurate reflection of most real-world cases of serious and sustained child abuse and neglect. Defining child abuse and neglect have not been easy for social workers. Many parents still consider physical punishment an appropriate means to discipline a child. Therefore, there has been a challenge in reaching a consensus on the actual definition of child abuse and neglect. However, this definition is likely to encounter difficulties in a legal scenario, in which the words substantial, unjustified and allowable normally arise. From the legal aspect, neglect often is only considered in the most severe cases. Dubowitz et al recommend that child neglect should be defined from the perspective of the child. Child neglect has traditionally been considered to occur when a need of the child is not met; therefore “a child-focused definition is logical if our primary purpose is to protect children.” The authors also point out that comparison views of neglect among various ethnic and cultural groups have been remarkably in agreement. Child abuse has not been as easy to classify. The definition of abuse is often based upon the conceptualizations and values of the researcher or adult. However, for most adults in our society, according to Chalk, these values have been so broadly accepted that we do not understand their inherent limitations as we try to consider the definition of abuse. For adults who were victims of abuse themselves as children, the value system is not the same as the non-abusing members of society. Obviously, a significant public discussion on the nature of abuse is necessary. Neglect as Child Abuse - Neglect as Child Abuse research papers discuss the main types of child abuse and the 'at risk' populations for child neglect. The Child Abuse Prevention and Treatment Act - The Child Abuse Prevention and Treatment Act was enacted in 2010 with amendments and reauthorization to the former act of the same name. Munchausen Syndrome - Munchausen Syndrome Research Papers research this syndrome as a form of child abuse, and gives characteristics of the parents who have it. Child Protective Services - Child Protective Services research papers discuss the government agency that responds to allegations of child abuse or neglect in the United States. Physical Abuse - Physical Abuse research papers overview the effects of abuse on children, women and men. Bad Parenting - Bad Parenting Research Papers explore the different types of bad parenting practices, and the psychological and physical effects. Abused Boys: The Neglected Victims of Sexual Abuse - Abused Boys: The Neglected Victims of Sexual Abuse is the textbook used in sociology classrooms to understand the ramifications of child abuse and sexual abuse in today's society. Parental Kidnapping - Parental Kidnapping applies to direct violation of a custody order put in place by a court where one parent takes the child or children in question out of the state, country or to an undisclosed location without the explicit permission of the other parent. How to Write a Research Paper on A Child Called "It"
Paper Masters writes custom research papers onA Child Called It and examines the problem of child abuse in David Pelzers book.